New York (CNN Business)That was fast. Wall Street's enthusiasm for the US-China trade truce has completely vanished. 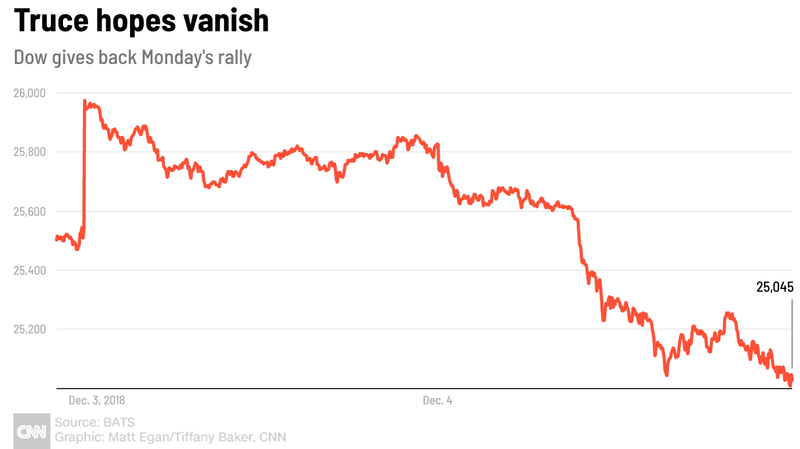 The selloff wipes out a chunk of last week's huge rally. The Dow jumped 288 points on Monday on relief about the ceasefire between the United States and China on trade. The selling erased nearly $800 billion from the S&P 500's market value, according to S&P Dow Jones Indices. Even though it was the Dow's fourth-biggest point decline in history, the percentage loss doesn't even crack the top 25 from the past decade. All three major indexes remain positive on the year. "This tariff situation still looms large over the market," said JJ Kinahan, chief market strategist at TD Ameritrade. "The market is now in a wait-and-see," Mnuchin said at the Wall Street Journal's CEO Council annual conference in Washington. "The market is trying to figure out is there going to be a real deal at the end of the 90 days or not." The VIX volatility index surged 26% on Tuesday. The Fear & Greed Index, a CNN Business gauge of market sentiment, fell into "extreme fear." "Inversion is usually the first sign of an economic slowdown," said Kinahan. He cautioned that further evidence is needed and signs of a recession are not evident in corporate earnings. S&P Global Ratings warned in a report published on Tuesday that "signs of cooling could be emerging" in the US economy. The credit ratings firm raised its odds of a recession in the next 12 months to 15% to 20%, up from 10% to 15% in August. Citing higher interest rates and the fading impact of tax cuts, S&P expects US GDP growth to slow from 2.9% this year to 1.8% in 2020. "This cycle is either in--or fast-approaching--its latter stages," S&P said. --CNN's Donna Borak contributed to this report. Stocks on a downtrend. The US-China trade war really has such a huge impact.